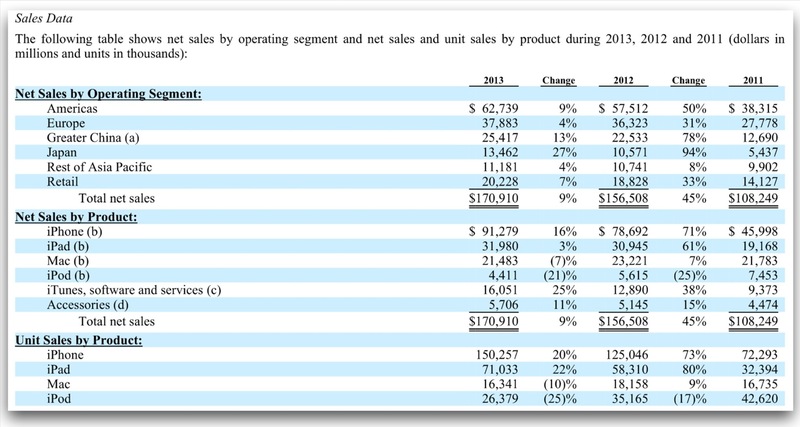 The fiercely competitive market of mobile devices is already mentioned in Apple’s Financial Reports. What we see everywhere are reams and reams of charts mainly about the two fighting companies Apple and Samsung and their operating systems iOS and Android. Most often neither the sources of the presented numbers are named nor are they explained. That’s very poor journalism and often just intended to get attention that means, to increase clicks on websites. always incite useless platform wars when published in social media. Users of Apple devices always get nothing but scorn and derision if Androids read those lines. Everybody is entitled to make his decision up to his requirements but also must be able to retrieve reliable data about companies when it comes to any financial engagement. As the leading industrial nation the USA developed rules for financial reports which are basically overtaken by other countries (even Germany, the country which is well-known for it’s very special and complex legislation nobody really understands). The responsible commission in the USA is the SEC (U.S. Security and Exchange Commission). All investors, whether large institutions or private individuals, should have access to certain basic facts about an investment prior to buying it, and so long as they hold it. To achieve this, the SEC requires public companies to disclose meaningful financial and other information to the public. This provides a common pool of knowledge for all investors to use to judge for themselves whether to buy, sell, or hold a particular security. Only through the steady flow of timely, comprehensive, and accurate information can people make sound investment decisions. for a number of specified events and must comply with a variety of other disclosure requirements. The SEC sets the rules, companies have to provide a well-functioning internal control system to generate testable data which then are validated or rejected by accounting firms or single auditors. The U.S. Securities and Exchange Commission (SEC) is an agency of the United States federal government. It holds primary responsibility for enforcing the federal securities laws and regulating the securities industry, the nation’s stock and options exchanges, and other things, including the electronic securities markets in the United States. The regulatory agency was created during the Great Depression that followed the Crash of 1929. The main reason for the creation of the SEC was to regulate the stock market of 1940, the SarbanesñOxley Act of 2002, and the Credit Rating Agency Reform Act of 2006. The enforcement authority given by Congress allows the SEC to bring civil enforcement actions against individuals or companies alleged to have committed accounting fraud, provided false information, or engaged in insider trading or other violations of the securities law. The SEC also works with criminal law enforcement agencies to prosecute individuals and companies alike for offenses which include a criminal violation. To achieve its mandate, the SEC enforces the statutory requirement that public companies submit quarterly and annual reports, as well as other periodic reports. In addition to annual financial reports, company executives must provide a narrative account, called the “management discussion and analysis” (MD&A), that outlines the previous year of operations and explains how the company fared in that time period. MD&A will usually also touch on the upcoming year, outlining future goals and approaches to new projects. In an attempt to level the playing field for all investors, the SEC maintains an online database called EDGAR (the Electronic Data Gathering, Analysis, and Retrieval system) online from which investors can access this and other information filed with the agency. Reports of companies are audited by accounting firms. Auditors receive a special training in universities and later on in the audit firms and it takes up to 10 years before they are qualified to do their job. The Big Four are the four largest international professional services networks, offering audit, assurance, tax, consulting, advisory, actuarial, corporate finance, and legal services. They handle the vast majority of audits for publicly traded companies as well as many private companies, creating an oligopoly in auditing large companies. It is reported that the Big Four audit 99% of the companies in the FTSE 100, and 96% of the companies in the FTSE 250, an index of the leading mid-cap listing companies. FTSE Group is a global leader in indexing and analytical solutions. FTSE calculates thousands of unique indices that measure and benchmark markets and asset classes in more than 80 countries around the world. FTSE indices are used extensively by market participants worldwide for investment analysis, performance measurement, asset allocation and portfolio hedging. Many leading pension funds, asset managers, ETF providers and investment banks work with FTSE to benchmark their investment performance and use FTSE’s indices to create world-class ETFs, index tracking funds, structured products and index derivatives. FTSE also provides many exchanges around the world with their domestic indices. A core set of universal principles guides FTSE’s index design and management: FTSE’s transparent rules-based methodology is overseen by independent committees of leading market participants, focused on applying the highest industry standards in index design and governance. The foundation of FTSE’s global, regional, country and sector indices is the FTSE Global Equity Index Series, which includes the flagship FTSE All-World Index. FTSE is well known for index innovation and customer partnerships as it seeks to continually enhance the breadth, depth and reach of its offering. FTSE is wholly owned by London Stock Exchange Group. 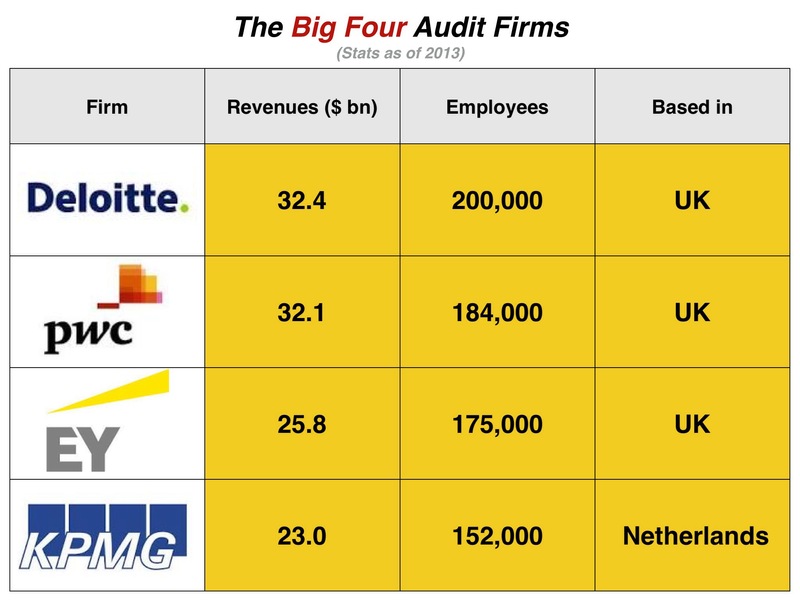 The Big Four firms are shown below, with their latest publicly available data. 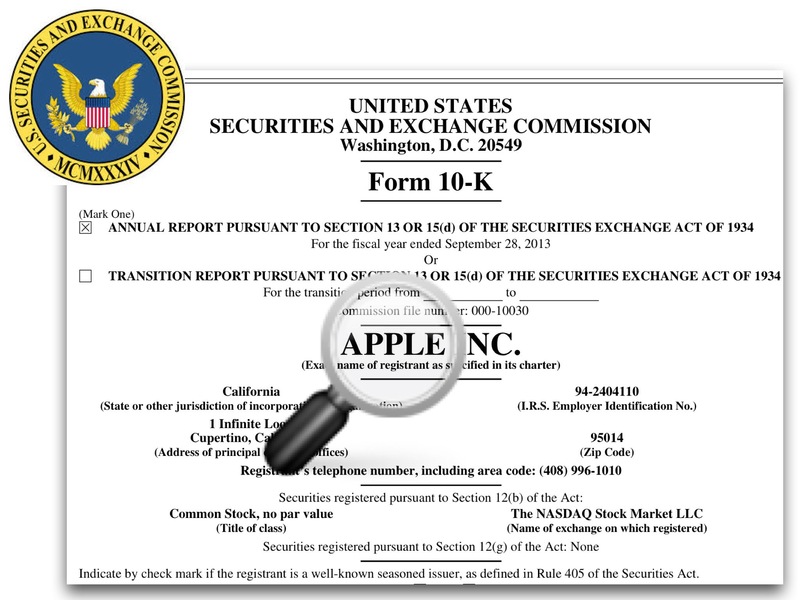 Ernst + Young has audited Apple Inc. and it’s internal control over financial reporting as of September 28, 2013, based on criteria established in Internal Control and Integrated Framework issued by the Committee of Sponsoring Organizations of the Treadway Commission. Apple Inc. and it’s management (Tim Cook, CEO, and Peter Oppenheimer, Senior Vice President, Chief Financial Officer) is responsible for maintaining effective internal control over financial reporting, and for its assessment of the effectiveness of internal control over financial reporting included in the accompanying Management’s Annual Report on Internal Control Over Financial Reporting. It’s in the resonsibility of Ernst & Young to express an opinion on the Company’s internal control over financial reporting based on their audit. The Company is committed to bringing the best user experience to its customers through its innovative hardware, software and services. The Company’s business strategy leverages its unique ability to design and develop its own operating systems, hardware, application software, and services to provide its customers new products and solutions with superior ease-of-use, seamless integration, and innovative design. The Company believes continual investment in research and development, marketing and advertising is critical to the development and sale of innovative products and technologies. As part of its strategy, the Company continues to expand its platform for the discovery and delivery of third-party digital content and applications through the iTunes Store. As part of the iTunes Store, the Company’s App Store and iBooks Store allow customers to discover and download applications and books through either a Mac or Windows-based computer or through “iOS devices,” namely iPhone, iPad and iPod touch ® . The Company’s Mac App Store allows customers to easily discover, download and install Mac applications. The Company also supports a community for the development of third-party software and hardware products and digital content that complement the Company’s offerings. The Company believes a high-quality buying experience with knowledgeable salespersons who can convey the value of the Company’s products and services greatly enhances its ability to attract and retain customers. Therefore, the Company’s strategy also includes enhancing and expanding its own retail and online stores and its third-party distribution network to effectively reach more customers and provide them with a high-quality sales and post-sales support experience. The markets for the Company’s products and services are highly competitive and the Company is confronted by aggressive competition in all areas of its business. These markets are characterized by frequent product introductions and rapid technological advances that have substantially increased the capabilities and use of mobile communication and media devices, personal computers, and other digital electronic devices. The Company’s competitors who sell mobile devices and personal computers based on other operating systems have aggressively cut prices and lowered their product margins to gain or maintain market share. The Company’s financial condition and operating results can be adversely affected by these and other industry-wide downward pressures on gross margins. Principal competitive factors important to the Company include price, product features, relative price/performance, product quality and reliability, design innovation, a strong third-party software and peripherals ecosystem, marketing and distribution capability, service and support, and corporate reputation. The Company is focused on expanding its market opportunities related to personal computers and mobile communication and media devices. These markets are highly competitive and include many large, well-funded and experienced participants. The Company expects competition in these markets to intensify significantly as competitors attempt to imitate some of the features of the Company’s products and applications within their own products or, alternatively, collaborate with each other to offer solutions that are more competitive than those they currently offer. These markets are characterized by aggressive pricing practices, frequent product introductions, evolving design approaches and technologies, rapid adoption of technological and product advancements by competitors, and price sensitivity on the part of consumers and businesses. The Company’s digital content services have faced significant competition from other companies promoting their own digital music and content products and services, including those offering free peer-to-peer music and video services. The Company’s future financial condition and operating results depend on the Company’s ability to continue to develop and offer new innovative products and services in each of the markets in which it competes. The Company believes it offers superior innovation and integration of the entire solution including the hardware (iPhone, iPad, Mac, and iPod), software (iOS, OS X and iTunes), online services, and distribution of digital content and applications (iTunes Store, App Store, iBooks Store and Mac App Store). Some of the Company’s current and potential competitors have substantial resources and may be able to provide such products and services at little or no profit or even at a loss to compete with the Company’s offerings. shows the operating expenses with a significant growth in research (doubled, compared to 2011). Reading all the numbers shows a company which is unique in the world. All other world-wide operating concerns are far away of being as powerful as Apple. A reason might be that Apple is not involved in the junk market with its fiercely price fight. But there are some other risks described in the annual report under Item 1A. 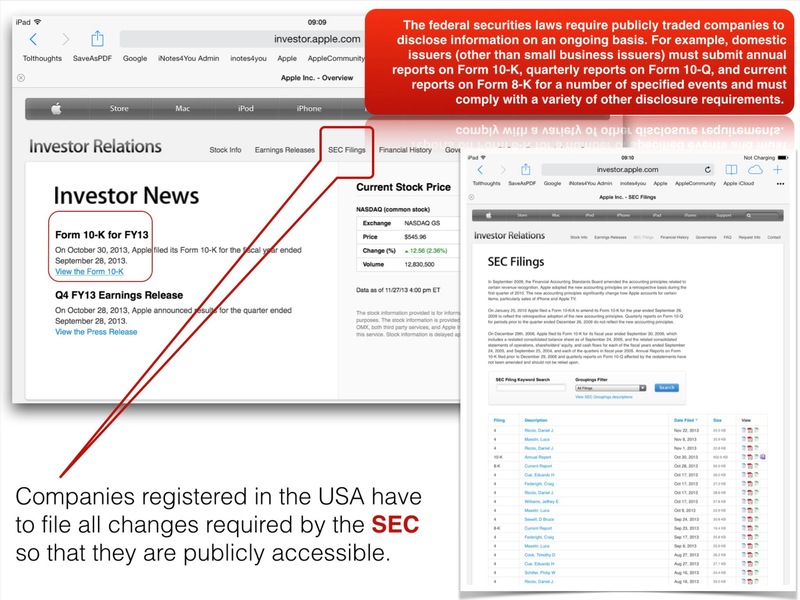 Reports of competitors registered at the NYSE (New York Stock Exchange) can easily be retrieved from their websites or from the SEC website. 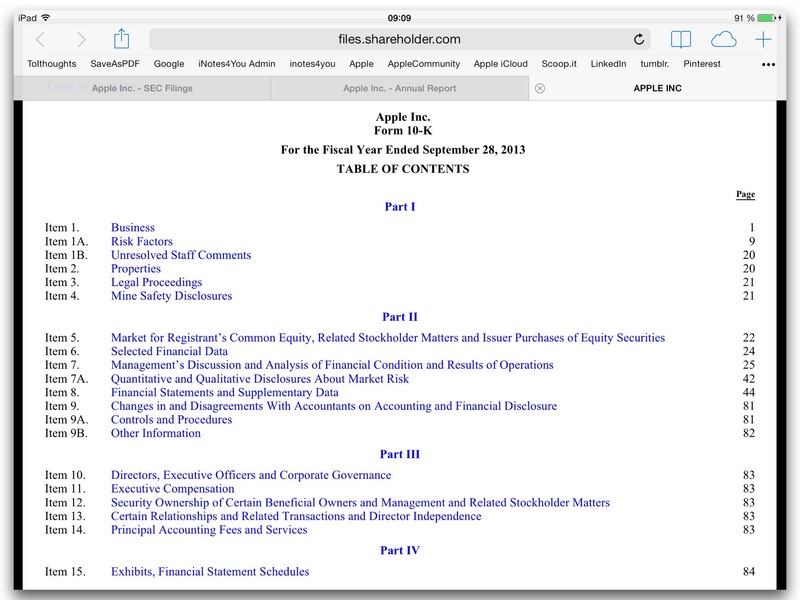 Extracting relevant stats from SEC filings is the only way to get reliable numbers.